3 tsp. of either Scotch whisky, brandy or rum Cream butter, add sugar and water and cream thoroughly. Add remaining ingredients. Shape into balls and bake in a pre-heated 350 degree oven until lightly browned on bottoms. Turn and brown other side. If the mixture falls apart when you are making the balls, add more water. 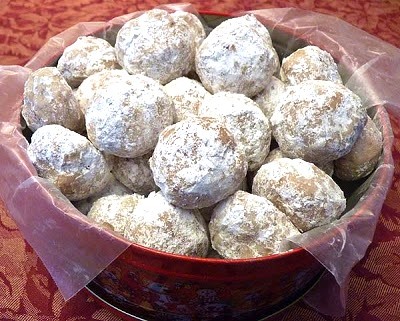 When baked, roll hot butter balls into sifted powdered sugar until the flour sticks to the balls. Refrigerate after cooled. We had these every Christmas day. They are divine.